When fall rolls around I find myself craving pumpkin items. I love pumpkin pie, pumpkin bread, pumpkin muffins, pumpkin roll, and especially pumpkin spice latte. The flavors of fall are so delicious and warm to me. My favorite season is summer, but my favorite change of season is from summer to fall. The air is crisp in the morning, but not too cold. The evenings cool off and the humidity of late summer is gone. These cookies are yummy. They aren’t like the traditional pumpkin cake cookies you often have. They are made with an ingredient you can only find on your store shelves this time of year, pumpkin pie pudding. This pudding is delicious all on it’s own but mix it into some ordinary cookie dough and you have the flavor of pumpkin pie in the convenience of a cookie. Cream the butter and sugars in a mixer until light and fluffy. Mix in the dry pumpkin pie pudding. Mix in the eggs and vanilla until well incorporated. Add dry ingredients and mix. Stir white chocolate chips in by hand so you don’t break them. Scoop the dough in rounded tablespoons or use a handy dandy scooper onto a parchment paper lined cookie sheet. 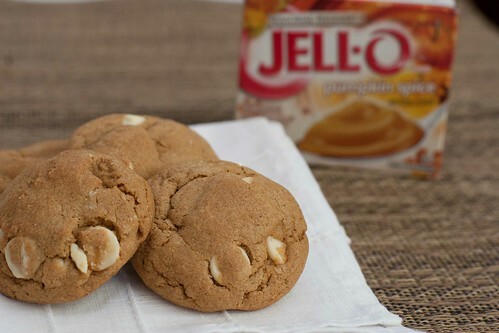 I absolutely love these scoops because they are easy and you get the most uniform cookies that not only look great but all cook perfectly at the same time. Bake at 350 degrees for 8-12 minutes. Enjoy! This recipe makes 48 cookies.